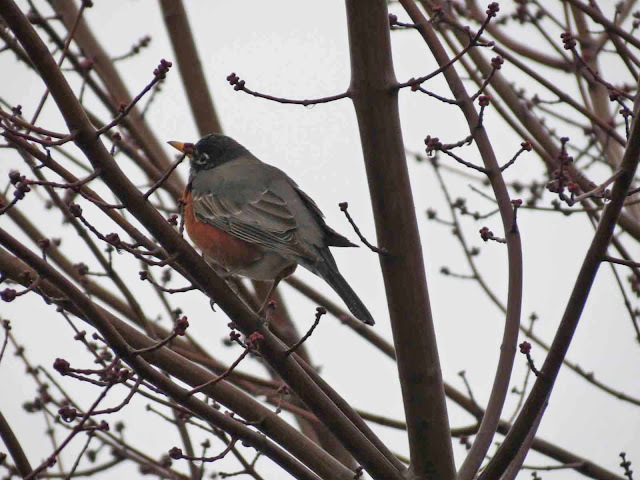 I spotted my first robin this year way before Punxutawney Phil saw his shadow and predicted six more weeks of winter. Personally, my money is on Bird. Neighbor down the street has bunches of daffies already in full bloom. According to Tree World “…trees actually form their buds during the summer, usually in August! Since trees are dormant during the winter, they don't have the energy to produce structures that are that small and complex! Buds aren't very apparent in the fall and throughout the entire winter. In the spring, however, they swell and are ready to open." Who knew? Well now I do. Today was cold, wet and dreary. Maybe Bird isn’t so smart after all or is she? This is the first time I have actually completed the NaBloPoMo (National Blog Post Month) challenge. Gee, that wasn’t so hard after all. So, I grabbed my NaBlogPoMo badge for March. This is going to be two days harder, but I feel up to it. After all Spring is in the air, right Bird? There was no February 29 in 1929. E. feels badly about her marriage. Very unhappy over her mistake and they seriously intend to break up their home. It's hard to believe and very sad that it should have happened. I was wondering the same thing about the marriage thing from Anna's diary. And I was in bed this morning, watching the neighbor's gigantic rock maple being ravaged by the high winds we were having and noticed that I could see buds on the ends of the branches. I started wondering if I just hadn't noticed that they had been there all along, because the weather the last couple weeks, while not all that wintery, has definitely not been spring like either. Now I know. Thanks! Selfishly, I am so glad you signed up for another month of daily blogging. I look forward to reading your posts. btw, could this comment of Anna's about E's marriage maybe relate to the changing ideas about marriage that were referenced a couple of weeks ago?